. استمتع بالخدمات الراقية والضيافة التي لا مثيل لها بهذا الفندق في جولد كوست. يقدم الفندق فرصة للاستمتاع بشريحة واسعة من الخدمات بما فيها: تخزين الأمتعة, صف السيارات, غرفة عائلية, مرافق للشواء, تأجير سيارات . استمتع بوسائل الراحة الراقية في الغرف أثناء إقامتك هنا. بعض الغرف تتضمن تلفزيون بشاشة مسطحة, شرفة/ تراس, تليفون, مروحة, تلفزيون لمساعدتك على استعادة طاقتك بعد يوم طويل. يقدم الفندق العديد من الفرص للاستجمام كمثل حوض استحمام ساخن, مسار جولف - ضمن 3 كم, حمام سباحة خارجي, صيد السمك, سبا. يشكل The Hill Apartments Currumbin Beach بخدماته الراقية وموقعه الممتاز، قاعدة مثالية للاستمتاع بإقامتك في جولد كوست. It was a pleasant apartment with great ocean views. It was comfortable but a bit dated. The view from the balcony compensated for the decor and the beds were very comfortable. We stayed for a weekend bike racing event and loved the proximity to the event, as well as the easy access to the beach and inlet. Staff were incredibly helpful and cheery, including the managers children who swam at the pool and had great conversations with guests. The view from the apartments was amazing, and the apartment was clean and well appointed. A magical few days! The apartments are located a very short walk to Currumbin beach which is perfect for beginner surfers, the apartment is spacious and clean. It has a nice pool, high on the hill. Be prepared for lots of walking up steep steps! The spa wasn't working which was disappointing. Our apartment was older style and the decor of entrance/stairs is alittle tired. It was moderately priced and the hosts were friendly. The room was very dirty, the fridge was disgusting. Very enjoyable however I would recommend that you make guests aware of the fact that there are no lifts from the car parks! Excellent. On booking I asked for the 2 bedrooms to both have double beds in them but was told all 2 bedroom apartments have 1 double bed and 2 single beds. On check in the receptionist told me she was able to reserve for us the only room that does have 2 double beds - she didn't want to promise that and then not be able to deliver. She was very friendly and helpful and we very much appreciated the 2 double beds. Beautiful hotel close to surf beach and the inlet with calm water for swimming. Nice restaurants nearby. Even though the location of the hotel is right under the flight path, inside we didn't hear the airplanes at all. Its like staying in a home away from home. Great for family which like staying together preparing own food. The restaurants around serve good food were expensive though. The Hill Apartments was a great place to stay for our Xmas holidays. Staff were super friendly and helpful. Great pool and BBQ area with awesome views. Could see the fireworks for new year from the balcony! Will definitely stay again. comfortable,nice staff and close to the zoo. 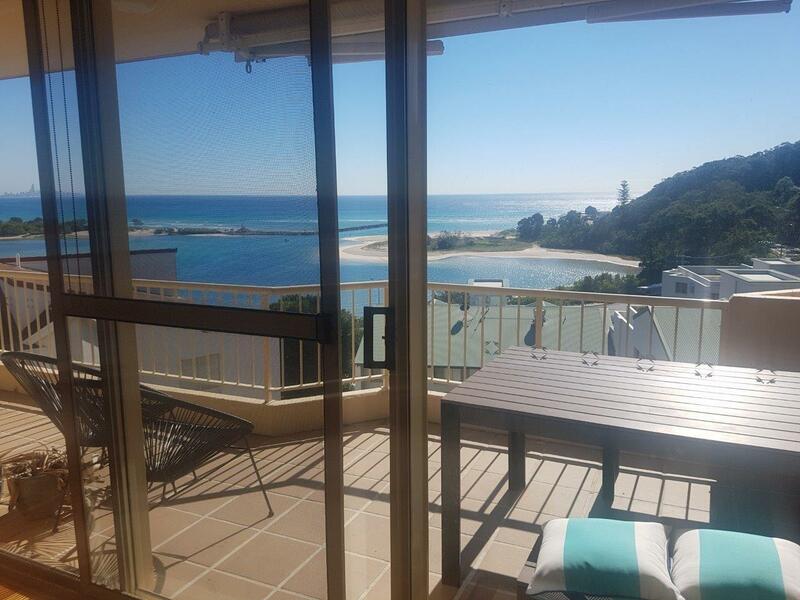 i feel very comfortable,joyful,pleasure and happy to stay at The Hill Apartments Currumbin beach. The location and sea view made me and my family feel very relaxed. The apartment is big so we can enjoy cooking overthere. we all have a great family time and gathering in this apartment. i really want to live there again .Also, the staff who is called Maggie is very helpful and nice. Great stay, amazing views over Currumbin Alley north towards Surfers Paradise. The surf school runs at the Alley for kids, beginners or those who just need to hire a board. Stand up paddle boarding, canoeing and a range of other equipment is available. Great family spot with the beach on the front door step, nice pool and spa in the complex cafe's and restaurants just a minutes walk around the corner. Keep in mind that these are holiday apratments not a hotel. So quality of fit and finish between apartments will vary and the usual hotel amenities such as room service are not really available. But who needs them when you can walk around the corner to a great cafe and sit by the beach. nice quiet part of the gold coast. walk to currumbin Alley. nice place to watch the sun come up. older building but still ok. The apartment, location and environment. We had a pleasant stay and pity we could spend only two days would have loved to stay longer. Maggie was very hospitable and friendly which made our stay comfortable. Make sure you get the pin number to get in as it changes every day, and is difficult to get in otherwise. The owners were exceptional with their communication regarding booking, maps etc. there were five of us on the second night and did not feel crushed, layout good. Great for a family holiday with sensational views towards Surfers Paradise. Would definitely stay again -great value.